Today, I'm having another one of those 'pinch-yourself-to-check-you're-not-dreaming' days. 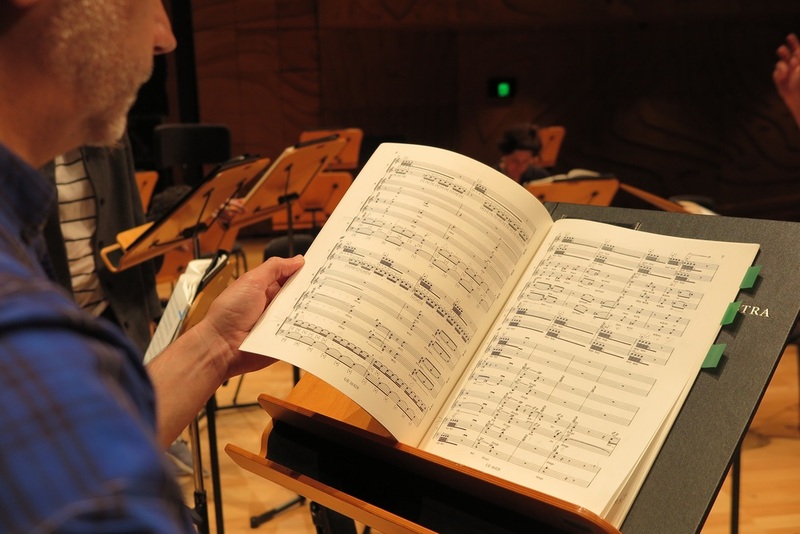 Tonight, Song Company perform alongside the Melbourne Symphony Orchestra in the Metropolis New Music Festival. We just had our sound check with Robert Spano, long time director of the Atlanta Symphony Orchestra. Amongst the town cries of Gibbons and Janequin, we're performing Luciano Berio's extraordinary (and difficult) Cries of London, written in 1975. In performing this masterwork of the 20th Century, I've been reminded of someone from my past. Just over ten years ago, when I was still at high school, I starting taking piano lessons with a woman in Palmyra. Her name was Mrs Thompson. She had been a promising concert pianist in the U.S (very much knocking on the glass ceiling) before she was hit by a car (the driver ran a red light) crossing the street, suffering major injuries. She survived, but needed extensive rehabilitation, and slowly learnt to walk and regain fine motor skills again. Her back would never truly heal. The pain of standing would be so great that she would be mostly wheelchair bound for the rest of her life. Hopes of a concert career vanished. But, slowly, she learnt to play the piano again, and began teaching. She was an exquisite musician, a great teacher, and had the most amazing hands. I remember her laying her hands over mine and playing 'through' them to show me what pianistic 'touch' really meant. She has been on my mind because I can point to her being one of the first people to expose me to contemporary classical music. In our lessons we of course played beautiful keyboard music by the likes of Bach, Scarlatti, and Mozart, but we also explored some little known early keyboard music, including the likes of Domenico Zipoli, the 16th Century Italian Jesuit missionary who moved halfway across the world to Argentina before dying very young of a mystery illness. But more importantly we played lots of contemporary music. We played the Bartok Mikrokosmos, serial music by American, Canadian, European, and Japanese composers, and a number of Australian works. After my lessons (which usual included at least half an hour of her time for free) we'd sit in her lounge and she'd play tapes (yes, real cassette tapes) of Copland, Cage, Stockhausen, Berg, Schoenberg etc. over a cup of tea. It was here, at the age of 16 that I first learnt to listen to contemporary music, how to get past 'the noise' and find the music. I will forever be grateful to her for that gift. The Elisabeth Murdoch Hall, Melbourne. Now, some ten years later, my life is full of contemporary music. Last year I premiered two new Australian song cycles at the Sydney Opera House, and premiered seventeen new vocal works with Song Company. Tonight, I perform one of the most famous works of Luciano Berio, and the next day give six world premiere performances of Australian works, specifically written by Melbourne composers for a project in the Melbourne Recital Centre. I have no idea if Mrs Thompson is still teaching (or still living in Australia) but I am making it my mission this evening to find her phone number and call her. It may be difficult as she was a notorious technophobe (see above re: cassette tapes) but I wonder how she'll react when I tell her that I've just sung / am about to sing Berio with the MSO. Thank you, Mrs Thompson, and all the other teachers who aren't afraid to show their students that the teaching and performing classical music doesn't have to be limited to the distant past. Song Company reviewed by Sydney Morning Herald. Full link here. In 1610, after transforming his musical style with what he called the seconda pratica, or "second practice", and creating the first musically significant opera, Claudio Monteverdi had a "retro" moment, composing a six-part Mass of gloriously intricate polyphony in the style of 16th century masters like Josquin and Palestrina. To clinch the connection, he based it on musical motives drawn from a motet by another 16th century composer, Nicolas Gombert, In illo tempore and it was Monteverdi's Missa In illo tempore and Gombert's motet that formed the central thread of the three parts of The Song Company's radiant presentation in the acoustically miraculous crypt of St Mary's Cathedral under their new artistic director, Antony Pitts. Standing in a circle on the terrazzo floor under the central vault, the building amplified and echoed the interweaving lines with iridescent resonance, building to a peak of intensity in the elaborate counterpoint that closes the Gloria and Credo of the mass that was quite magical. The three parts of the concert followed an Easter theme – Tomb, Hades and Throne – and each involved a short piece by Pitts himself and music by English Renaissance composers William Byrd and William Mundy and Australians Elliott Gyger and Alice Chance. Gyger's Creator alme sideru used an old plainchant as the basis for an elaboration in sensitively tonal style which evolved towards densely voiced chords of rich dissonance, using this composer's characteristic sensitivity to vocal capacity. Chance's piece, And the Lord said, Fiat Lux, sung by a treble subgroup from behind the audience, explored darker sounds and caressing astringent suspended dissonances to create the idea that with the creation of light comes life and pain. Pitts' music expanded classic polyphonic vocal textures to incorporate modern harmonies within a broadly consonant framework and an original and sensitive understanding of the voice. As new director, Pitts continues and honours The Song Company's special expertise in the glories of the Renaissance under previous director Roland Peelman, while also bringing a distinct and cogent personal perspective. This was a concert of rare and transcendent beauty. Song Company reviewed by Limelight Magazine. Full link here. In a year 11 maths class, I distinctly recall having an argument with a school peer about whether Tchaikovsky or Beethoven was the greater composer. When I proposed the question “Tchaikovsky or Beethoven?” to my teacher, he replied, “Monteverdi”. Without Monteverdi’s towering figure in Western music, none of the proceeding greats would have been possible. In the Crypt of St. Mary’s Cathedral, the a cappella vocal group The Song Company put on a performance of early music, including Monteverdi, Gombert, Byrd and Mundy, together with works in a polyphonic style by contemporary composers including The Song Company’s own Artistic Director Antony Pitts, as well as Australian composers Elliott Gyger and Alice Chance. Though the long weekend is behind us, this concert is supposed to arouse the drama, majesty and mythic spirit of Easter. Given the holy location, the superb singing and the well thought out programme, it was quite a success. The concert was divided into three parts, representing three aspects of Easter: Tomb, Hades and Throne. The sections ran onto one another without applause, maintaining the sense of gravitas and mystery, connected only by a few thespian readings of poems by polymath Pitts himself. Each section incorporated a movement from Monteverdi’s Missa In illo tempore, using and exploring themes and motifs from works by Gombert which in turn featured in the programme. Each section also worked in Thou wast present as on this day from Pitts’ Requiem for the Time of the End. The unifying element was the fluidity of time, the connection between past, present and future and, of course, the musical thread of polyphony that can arouse a sense of the eternal in the hands of a dexterous composer. The singing throughout was precise and unforced, the vocalists taking advantage of the Crypt’s natural amplification. Pitt’s direction from within a circular arrangement ensured a tight relationship between vocalists, as well a democracy of the six singers. There was some thoughtful choreography, such as in the Byrd, where the soprano solo circled the other singers, as the sun moves around the sky, the homophony drawing out the theme of light banishing darkness. The contrast of plainchant and homophony against more daring and dissonant lines in Gyger’s and Pitts’ works was striking but soothed by the ultimate resolution in the form of Monteverdi and Mundy – again highlighting the fluidity of time and composition. Though all singers played their part, Andrew O’Connor was notably strong and full-bodied in a number of the items, particularly the Gyger. The arrangement of Thou was present as on this day in the final section (Throne) was notably resonant through a series of sustained, clashing high notes before giving way to Mundy’s promise in In aeternum of salvation through belief in God’s precepts. It is no secret that one of my favourite times of the year is our time in north west NSW, assisting with the Moorambilla Voices project. Song Company has been an artistic partner with Moorambilla every year since 2013, and this year we have expanded our involvement (thanks to the generous support of the St George Foundation) to include a week of skills tours as well as the residencies in August and September. We will also be performing with Moorambilla Voices at both Parliament House and Government House in June. Mark Donnelly, Hannah Fraser, and Andrew O'Connor on the road with Song Company just outside Lightning Ridge. If you haven't heard about Moorambilla Voices I urge you to visit their website here, but I will try and sum up its important work in a couple of sentences. Moorambilla represents the opportunity for hundreds of children exploring their previously untapped artistic potential, in an environment that connects them to the land that surrounds them. They explore the narrative and rich history of this lands first peoples via some of Australia's finest composers, musicians, choreographers, and regional artists. The program strives to make them proud (sometimes for the first time) of their talents and help them recognise how art can define, nourish, and sustain them as individuals. Education is one of the cornerstones of Song Company's mission. We believe that every child deserves to know and hear the magic of song, and understand the joy of music making. This is one of the key objectives we share with Michelle Leonard and her Moorambilla Project. We belong to a continent whose first peoples use songlines, dance, and stories to pass knowledge and culture from generation to generation. The Moorambilla Voices project, now in its eleventh year, connects thousands of students to music, music literacy, and music making each year. At best guess, Michelle guesses that at least 12,000 students have been engaged in these workshops over the past decade, and at least 2,000 of those have been directly involved in Moorambilla Voices or the MAXed Out Company. This is an amazing achievement. Java Jive! Song Company (when we were four with Susannah Lawergren) on tour with Moorambilla Voices Artistic Director, Michelle Leonard. Sunrise in Coonamble, NSW. Desert skies really are unbeatable. As you can imagine, this is no small feat! I want to extend my personal thanks to the St George Foundation who allowed Song Company to join Michelle, and her team (Dayle, Annie, Beth, and Karen) who are an organisational force to be reckoned with. Their support allows us to do this valuable artistic work. Who says learning can't be fun? Making music (Playschool style) at Bourke-Walgett School of Distance Education. Now. Back to the music. Some of you might be wondering: What does this type of skills workshop looks like? How do you make 100+ kids sing for you when they've never met you before? What did you sing for the kids? The answers might surprise you. A typical day involved back-to-back workshops in different schools, sometimes separated by hundreds of kilometres. We became very quickly accustomed to a packed lunch which we'd hurriedly eat between schools! Here's a fly-over of our time in regional NSW. We flew out of Sydney at 7:25am on Tuesday morning (looking glamorous in our new t-shirts) and arrived in Dubbo with just enough time pick up a car, order a coffee, and make for our first school. The sessions begin with a brief musical introduction from Song Company (Java Jive as made famous by Manhattan Transfer) before Michelle gave them a crash course in basic music literacy and notation. What normally can takes weeks in a classroom, can take fifteen minutes with the right tools. With a little help from Song Company, a small splash of silliness, and a system that ties score reading to the human body, children can read music in treble clef within fifteen minutes. Proof that music is an innate language if we give children the right tools. We would then usually jump straight into more singing. We began our week with a quartet of singers (Susannah, Hannah, Mark, Andrew) but sadly we lost Susannah to illness on the first day. Already due to be 161km away by the second day, we had no choice but to send Susannah home to rest, and battle on with three. Sometimes that's what life on the road is like!! In the remaining workshop time (sometimes 30 minutes, sometimes less) children would learn (entirely by ear) Stephen Leek's Ngana, and Alice Chance's Palapalaa or Andrew Howes' Yanaya - the latter two being works composed for Song Company and Moorambilla Voices. We'd teach these pieces by breaking the works down into their musical parts. Ngana is a buzzing and energetic three part canon (in our adaption for three voices) that illustrates the concepts of syncopation, the harmonic language and modality of much of Leek's music, the strength of rhythmic and harmonic unison, or the sonic effect of a three part canon, usually performed from three points in the room for full surround sound effect. Palapalaa contrasts this with two beautifully lyric call and response themes, a modal soprano theme, contrary motion bass line, and a soaring syncopated tenor line. This was our most popular piece of the week, and became a favourite of Hannah, Mark and myself. This was due in no small part I'm sure to the text, a local indigenous story (told to Alice and Michelle by Aunty Brenda, a member of the language nest from Lightning Ridge) which tells the story of a butterfly (from Coocoran Lake) whose wings were captured and set into stone when she flew too far away from home, and was frozen on the ridge of the Warrumbungles. The colours melted from her wings when she thawed in spring, and flowed downstream into the rocks and stones near her home. Which stones? The world famous Black Opals of Lightning Ridge. Remember this story the next time you look at an opal! It made so much sense to bring this piece back to the landscape which inspired it. That's one of my favourite things about the entire Moorambilla project - its connection to the Australian landscape in all its rugged beauty. Yanaya was reserved for our workshops at Lightning Ridge High School, Coonamble High School, and the Dubbo Regional Conservatorium (where we had extended sessions to also work on dance, composition, and body percussion) and draws inspiration from the nearby Narran Lakes. Usually sung with chamber orchestra and piano, the flowing rhythmic underlay supports the arc of the main melody, and partners with other derivative tunes from the same material. Composed for the MAXed Company (the high school arm of Moorambilla) it was particularly useful when Mark and I were modelling the adult male voice to our teenage participants. There is great power (and a sense of pride) in being able to model singing to children (of all ages) and having them respond. Singing is so much about physicality, and as any singing teacher will tell you, once a student connects their voice to their physicality (or their brain to their voice) there is sudden and huge improvement. Seeing this 'penny drop' moment in our workshops is always inspiring, and reminds us of why we choose to spend our lives singing. We, the singers of the Song Company, were all that student once. Being able to pass on some of our experience is a very valuable thing indeed. At this point I must also acknowledge the true impact of this program, in that the children (or young adults) who have been selected for the Moorambilla program bring their knowledge, leadership, discipline, and skills home with them. This region of NSW is geographically and politically isolated, removed from the usual 'artistic' opportunities of the city, and some children face disadvantages and hardships that we often take for granted. I won't begin to describe the difference between a 'Moorambilla Kid' and a 'Non-Moorambilla Kid' to you, but needless to say, a child who has had access to this program: who is told that they matter, that they have talent, that they are good - is much more able to adapt to challenges, solve problems, and recall skills. In the world of science and education, we call this Neuroplasticity, and music making is one of the only activities known to man that engages the whole brain, and allows neural pathways to reorganise and adapt. A 'Moorambilla Kid' leaves the program not just with new skill set, but with a stronger stance and a more adaptable mind. Beyond the music, the landscape in this part of the world is also inspiring. The weathered tops of the Warrumbungles (an ancient volcanic mountain ridge) and the surrounding grassland, a sky that stretches in perfect blue across a seemingly limitless horizon, the awe inspiring wonder of a desert night sky, the dry creek beds that belie the water stored below in the Great Artesian Basin, and the artesian bore baths in Lightning Ridge that bring soothing hot mineral water from three kilometres beneath the earth to the surface. Sunset in Lightning Ridge, NSW. Just prior to an outdoor screening of Wide Open Sky. We ended our week, exhausted but happy, with an open air screening of Wide Open Sky in Lightning Ridge (complete with stereophonic cicadas and a desert sunset) and a midnight dip in the artesian bore baths. Wide Open Sky is a documentary about Moorambilla Voices which picked up an audience favourite award at the Sydney Film Festival in 2015. It opens in cinemas nationally in April. If you're interested in anything you've just read, or are curious about the Moorambilla program, please check your local cinema for listings. I can't wait to return to Baradine in August. Until then I'll be dreaming of the crystal clear night sky, the music and dance inspired by the landscape, and the bore baths in Lightning Ridge. When Jonathan Larson's Pulitzer Prize and three-time Tony Award-winning Rent opened on Broadway in 1996, just hours after he had died after suffering an aortic dissection, Act Two's opening number, 'Seasons of Love' was bumped to the start of the show, in tearful tribute of Larson's memory. It immediately became a stand-alone 'hit' of modern musical theatre, and owing to the HIV status of the show's characters, an anthem for HIV-AIDS awareness. As I reflect on my first year with The Song Company, I am drawn to these words. And so, I have to ask myself: What encapsulates all of the amazing experiences I have shared with my colleagues this year? How do you measure a year in the life of The Song Company? When I packed up my life in Perth, and jumped in a car with my best friend to make my one way trip over the Nullarbor and the Great Ocean Road, we had a clear measurement of the journey. The drive was, as expected, spectacular. But of course (to use the old cliché) it was the journey (and all the memories shared along the way) that would define the experience. The hours of in-car banter and GoPro situation reports; dusting off our swags each morning when packing the car; turning each new corner along the Great Ocean Road and exclaiming 'Wow! '; camping on the beach during a catastrophic gale-force weather warning; getting 'lost' momentarily halfway between the Eyre Highway and Fowler's Bay; spending the night in a converted church with a bathtub in place of the altar. We loved it so much, we plan on doing a Sydney > Cooktown, QLD drive in July! If I wanted, I could measure my first year with the Song Company in a similar fashion. A tower of scores on my piano, 51cm high. It is true that 2015 was a huge year -- a year of firsts. A year of personal and artistic growth like none other. Debuts in some of Australia's most iconic performing arts venues: the Sydney Opera House, Melbourne Recital Centre, and City Recital Hall. Twelve domestic flights and hundreds of kilometres covered by car across four states. But is this how I measure my year with the Song Company? Of course not. Like the journey that brought me to Sydney, my first year with the Song Company is full of precious memories. I like to divide the work we do as ensemble into three categories: Performance, Education, and Collaboration. Each is vitally important to our working life and relevance as an ensemble. It's my task to try and wade through some of the highlights. Of the many unique performances we have given this year (culminating in the extraordinary programming of twelve new Australian commissions for our all-Leunig Song Almanac) I must say that one of the most moving was Roland Peelman's Point Final -- a dedication to his 25 extraordinary years of music-making and artistic leadership. The concert was a melting pot of Franco-Flemish, Armenian, and Australian music spanning several hundred years. To my mind, this programme encapsulates the versatility of the ensemble to a tee -- as happy singing pop and jazz arrangements, as it is a reconstruction of a medieval part song. Coming from a professional background in music education (vocal coaching and choral conducting) I know first-hand the benefits of the Song Company's education package, and it's ability to inspire children and teachers alike. Our school shows, in partnership with Musica Viva in Schools, are full of laughter, and the simple joy of singing. Children teach us much about performing. A gym-ful of K - Y3 students is a tougher audience than most adult audiences! I would often leave our three-show school days totally exhausted, but with a grin plastered on my face. The third pillar of our work is collaboration. In a way, one could argue that everything we do, as six solo voices working together in an ensemble context, is collaborative. This year alone, we have performed with some extraordinary artists; the New Zealand String Quartet, Andrea Keller, William Barton, Australian Haydn Ensemble, Simone Vallerotonda, Oguz Mulayim, Amelia Farrugia, and the Acacia Quartet. There were so many incredible performances this year -- whether it was hearing the reverberations of the Turkish Ney amidst the polyphony of Robert White's Lamentations in the Crypt of St Mary's Cathedral; performing Jack Body's final piece, Cries from the Border just hours before his death with the New Zealand String Quartet; performing Haydn's Seven Last Words with the Australian Haydn Ensemble in the grungy, near-dark, exposed stonework of Cell Block Theatre, only illuminated by the light of coloured projections and a myriad of Edison globe lightbulbs; or hearing the deep and unmistakably Australian echoes of William Barton's didgeridoo in St James, King Street. Collaboration allows us to explore new ground with our singing, and adds a new dimension to our performances. But perhaps my favourite memory of the year -- and one that threads together performance, education, and collaboration -- is Song Company's time with the Moorambilla MAXed out Company and Moorambilla Voices. Michelle Leonard's remarkable education programme saw us act as mentors to approximately forty young adults (Y7-Y12) from Central and Western NSW for a week in August, participating in a indigenous cultural immersion, and interacting with choreographers and composers to create a hybrid work of music, theatre, and dance. For this, their 10th Anniversary year, we worked with Jacob Williams (Queensland Ballet), Andrew Howes (Composer), Alice Chance (Composer), Anton Lock (Composer, Dancer), some of Sydney's finest chamber musicians, and TaikOz to create a work representing the Narran Lakes -- an ancient home and nesting ground of migratory waterbirds. We belong to a continent whose first peoples passed on traditional knowledge and culture through songlines. It was a very moving, and dare I say, a uniquely Song Company experience to share the stage a month later in September, with 200+ children and share part of this country's great story. As we rehearsed together in indigenous language: speaking of underground waterways, rocks, trees, rivers, ancestors, birds, and the black sands of Narran Lakes, I regularly found myself with tears in my eyes. Beyond rehearsals and performances I have also (naturally) developed fond memories with my colleagues -- Susannah, Anna, Hannah, Mark, and Richard. It is not easy to jump into an ensemble with such history as the Song Company, performing much of our contemporary and jazz arrangements from memory, as well as our schools programme, and many other pieces in our early music repertoire. They have been endlessly warm, kind, patient, and supportive. I cannot thank them enough. My thanks too, must go to the Song Company board, and the entire office team -- in particular Alicia, Emma, Irene, and now Andrew -- who keep us all on task and allow us to bring the joy of music to our audiences. It goes without saying that I must also thank Roland Peelman for his inspiring musicianship and artistic leadership, and for taking a chance on a young-ish bass from Perth and offering him a job that I love coming to, every single day. We are all very excited about what the 2016 season holds, as we welcome Antony Pitts (UK) as our new Artistic Director. We were lucky enough to have Antony join us at the Moorambilla Festival in September. Not only did we throw him in the deep end and ask him to conduct us with less than 24 hours notice, but we spent time rehearsing music for the 2016 Season Launch. I have a favourite memory of this time -- one that sums up the friendship our singers share. It was a Sunday afternoon. After a week in the crystal-clear night skies of Baradine, and three performances with Moorambilla Voices, and the Leichardt Espresso Chorus -- we settled in for lunch at the Pastoral Hotel in Dubbo. With several hours to burn before our return flight to Sydney, and with babies Patrick and Horatio at our feet, we decided to continue rehearsing. Taking turns to babysit young Horatio, juggling scores, baby bottles, wine glasses, and with a crawling one-year-old Patrick roaming around -- we rehearsed music from Monterverdi to Kats-Chernin to an unsuspecting 'publican' audience. It was a genuinely hilarious experience, but managed to be one of the most productive rehearsals we'd had all year! And so, after that brief trip down memory lane I return to my original question: How do you measure a year in the life of the Song Company? Beyond the cups of coffee, the miles we travel, and the laughs we share, 'Seasons of Love' suggests that we should measure year in love. Happily, at the SongCompany, each of us love to bring music from all times and places to our audiences: whether it's a classroom of children, one of our many regional venues, or our home audience in some of Sydney's most recognisable cultural landmarks. I cannot wait to get back to work in 2016, as we embark on another year of incredible music, and begin a new chapter of music-making with Antony Pitts at the helm. PS - Until then, there is much Christmas music to be performed! Richard, Susannah, and I will be performing at a private function with the SSO Quartet next week; I perform music of Michael Praetorius with Australian Baroque Brass on the 10th December at St James, King St; more Christmas music with Sydney Antiphony (also features former Song Company Young Artists Sonya Holowell, Owen Elsley, and Rob Hansen) on the 18th December in Rushcutter's Bay; and one of the Weihnachtskantaten (Christmas Cantatas) of J.S Bach on the 23rd December, again at St James, King St. You will find more details for all of these in your Song Company newsletter. A review of Hourglass Beach, in the Utzon Room, Sydney Opera House. In true form to its aesthetic and mission statement as a chamber ensemble, Sydney’s new Hourglass Ensemble provided a mix of Polish and new Australian music including two world premieres in the Utzon Room. The programming provided opportunities for each of the artists to display their solo playing as well as demonstrate their tight, chamber ensemble skills. The evening opened with Peter Sculthorpe’s ‘DreamTracks’ for clarinet, violin and piano. This piece takes influences from the musical ideas of ‘Dijilie’, and taken from the larger ‘Songlines’ series. The three musicians rendered their intricately woven musical parts together and created a vibrant rhythmic and textural scape. Gregory Kinda’s piano part provided the rhythmic and harmonic framework over which Andrew Kennedy on clarinet and Beata Stanowska danced and floated. Here, we heard some extremely fine ensemble playing matched with an enthusiastic presentation of this work. The next piece on offering was a world premiere by Margery Smith. ‘White Shadows’, dedicated to her brother Peter, who tragically took his own life this year, is an exploration on the themes of impermanence, loss and isolation. Before the piece began, Smith spoke to the audience about the process of writing the work and the importance of the text. Poet Lidja Simkute then took to the stage and recited the text contained in the final movement. It is certainly refreshing to hear composers talk about their personal experiences and how this is displayed in their work. The fifth movement ‘En Plein Air’ contained text from Rita Bratovich, based on the writings of Peter. The opening of this piece set the tone for the remainder of the work and a delicate atmosphere was soon established. The flute was placed off to the left and the violin to the right, gently echoing in the distance before moving closer to the rest of the ensemble. This was an extremely well crafted and considered composition that explored many shadings of colour from instrumental combinations. Baritone Andrew O’Connor, who was a guest soloist, relieved the lines of text with tenderness and delicacy, his velvety voice gliding atop the musical lines from the chamber ensemble. O’Connor’s expression and shading in these songs brought the poetry and the text to the fore. To conclude the first half was a new work by Australian composer Michal Rosiak: ‘Contrasts’ for flute, clarinet and piano is cast in two contrasting movements. The first movement contains spiky harmonic and rhythmic episodes that quickly move into new musical ideas. Overall, this piece contained many fast-paced ideas that quickly changed without really evolving the musical line. Frantic episodes emerged and submerged themselves in a virtuosic feast. The ensemble performed to the highest of standards and the interplay between Kowalski on flute and Kennedy on clarinet was highly charged. Kinda’s pianistic gymnastics provided a tightly woven rhythmic impetus upon which the foundation of the ensemble was situated. Opening the second set was Ewa Kowalski performing the solo flute work ‘Orient Bis’ by Adam Porebski. The piece draws on Japanese and Chines flute playing and explores extended techniques such as triple and double tonguing, flutter tonguing and glissandi, all which demonstrate exciting tonal palettes from the flute. Kowalski’s control of tone was highly developed and her control of the instrument highly crafted. Her approach to the extended techniques explored every subtle nuance of the flute and she was able to display all of her skills, technique and stagecraft in this virtuosic performance. The centerpiece of the evening was a solo piano performance from Gregorgy Kinda, whose musical craft and sensibility were evident from the first few notes in his rendition of Grazyna Bacewiz’s Piano Sonata No. 2. This piece was composed in the early 1950s and displays a plethora of influences, ranging from hefty Russian rhythms and dissonances to elements of jazz, French music and Impressionistic overtones. Kinda’s thunderous approach demonstrates his total command and control of the Steinway piano, much like a race car driver behind the wheel of at high speed event. He propelled highly climactic music forward with every phrase. This was a charged performance of a work that had nearly everything in it. I had always thought Horowitz was my favourite pianist – and then I heard Gregory Kinda. The concluding piece was another world premiere. Kennedy’s ‘Hourglass Beach’, for chamber ensemble and baritone explores themes of morality in today’s world. Beginning with a modal sounding harmonic framework, the musicians wove individual lines around musical ideas. Guest soprano Suzi Stengel entered the stage midway through the work and sung a lament in the second movement ‘Three Lullabies’. The soprano voice added a change of colour and pace to the work and served as a new palette before Andrew O’Connor took the reigns to conclude the piece. Andrew Kennedy’s scoring was well considered and thoughtful. His use of tonal language included modal elements and strong melodies. This was a stand out performance from the Hourglass Ensemble in its inaugural performance as Sydney’s newcomer to the chamber music scene. Throughout the evening the group engaged with the audience, explaining the pieces and giving personal stories about the players. The room was charged with energy and enthusiasm and if this performance is anything to go by, it is safe to say Hourglass will have a very bright future as a high calibre chamber ensemble. How do you commemorate an event of unimaginable horror? It’s a question many arts organisations have been pondering in recent months as the centenary of the ANZAC campaign at Gallipoli approaches. Some, such as the ACO’s Reflections of Gallipoli for example, have opted for unflinching historical accuracy, confronting the audience with the magnitude of the death and suffering experienced in those Turkish trenches one hundred years ago. This approach is strikingly effective, not to mention affecting, but there is another tact, such as that explored in the Song Company’s Lamentations for a Soldier, staged in the crypt of St Mary’s Cathedral. Rather than attempting to take an audience back in time to relive and remember the senseless destruction of the Dardanelles campaign, Artistic Director Roland Peelman has adopted a more serene, spiritually cleansing, and ultimately uplifting programme in tribute to this pivotal moment in our Nation’s history. The hopeful, forward-facing message of this commemorative programme, delivered with subtlety and deeply moving poignancy, is one of peace and multi-cultural acceptance. The most conspicuous connection to the ANZAC centenary is the acknowledgement of the two cultural identities that a century ago clashed during the bloody Gallipoli campaign. Throughout the programme, in a beautifully poetic display of reconciliation, music from Turkish antiquity, performed by Oguz Mülayim on the ney (a Turkish, wooden flute) is woven in and out of ancient music of the Christian faith, representing in music the historical and cultural roots of the two armies who fought and died during the battles on the Turkish peninsula. Binding these two radically different aesthetics together were the works of three contemporary composers, whose carefully curated roles allowed a cohesive thread to run from start to finish through this diverse evening of music. This is typically savvy programming by Peelman, who is an expert at delivering pathos laced with a healthy dose of cerebral stimulation. The breathy, spectrally ethereal tone of the ney, resonant within the welcoming acoustic of St Mary’s crypt, yet nonetheless incongruous in its exoticness, introduced the first of five short pieces by Turkish-Australian composer Ekrem Mülayim, Some Echo Still, in its world premiere performance. These short movements, dotted throughout the programme, were inspired by the writings of Sufi mystic, Rumi, although not conventional settings of these texts as such. Small fragments of vocalised sounds, spoken phrases, and chromatically serpentine melodies pass between the six singers of the Song Company, arranged in a circle at the centre of the crypt. The swirling vortex of fractured repetition evokes the furious spinning of the whirling dervishes, but also cycles of the universe, orbits of planets and galaxies, and the movements of atomic particles. An exhaustively thorough amount of academic preparation (as outlined in the programme) was used to fathom out the implied rotational relationships at work within the music, and this rigour occasionally make these pieces feel overly sterile. However when Mülayim allows the music to connect with a more instinctual, emotionally rich language, its impact is immediate and powerful. Of the English Renaissance music offered, which included two different settings of When David Heard by Thomas Tomkins and Thomas Weelkes respectively, Robert White’s Lamentations for six voices yielded the most compelling performances. Breaking down into trios and duets, before revelling again in the complexity of six-part polyphony, this richly spiritual music not only showcased the superb blend and musicianship of the Song Company (particular praise should go the ensemble’s newest member, Bass Andrew O’Connor, who was a faultless foundation throughout the evening), but also made full use of the gloriously generous acoustic of St Mary’s Crypt. Kim Cunio’s setting of Psalm 57, the second of the evening’s three contemporary works, also took full advantage of the rich acoustic setting, with thick, pleasingly dissonant harmonies mixed with hand percussion that at once made reference to both the secular medieval tradition of central Europe and the ethnic musical heritage of the Turkish ney. For the final piece of the evening, Arvo Pärt’s Da Pacem Domine, the ensemble processed to the distant end of the crypt, allowing the remoteness of the performance to make room for a moment of personal reflection. Composed in 2004 in memory of the victims of the Madrid train bombings, Pärt’s simple yet devastatingly beautiful piece is a tranquil anthem of peace and remembrance; a perfect summation of everything this tribute concert endeavours to honour. Special praise must be reserved for the hard-working continuo group, with Laura Moore taking pride of place with her constantly alert cello playing. She also provided a sensitive viola da gamba obbligato for the alto aria Es ist vollbracht. It was also gratifying to note that Trevelyan-Jones included both a harpsichord (Anthony Abouhamad) and organ (Alistair Nelson) in the continuo group, as there is persuasive evidence that Bach did likewise. Performances by the Choir of St James’ have now become self-recommending and the next concert in their subscription series will be of a capella music on Saturday 9 May. “Their diction, precision and control were brilliant and I hope the general Perth music going audience get to see more of this group in the near future. It was hard to know what to admire most in the New York debut of the Australian Voices on Wednesday evening, the music itself often being the least of it. Six singers, representing the larger group based in Brisbane, performed at West Park Presbyterian Church in the Center at West Park program, conducted and sometimes joined by their artistic director, Gordon Hamilton, in a fast-paced concert with a heavy representation of Australian and new music, some with the pages barely dry. Most of the new music and arrangements were written by members of the group or composers close to it, back home and in New York, with an obvious ear to the overall beauty of the voices and the specific talents of individual singers. The music played to their abilities — one singer using throat-singing, evoking the grumbly didgeridoo; another, overtone singing to produce two pitches at once, one of them an eerie but lovely whistling sound — and to the virtuosity of all. Not least remarkable was that the performances were done from memory: this in works that had nonsensical texts or that set mere initials and numbers, as in Mr. Hamilton’s “Toy Story 3 = Awesome!” and “Initialize.” And some of the music had been finished just days before. One composer, Ralph Farris, the violist of the string quartet Ethel, played in several pieces, including his own “Inner Landscape,” along with Dorothy Lawson, Ethel’s cellist. Another, Joseph Twist, an Australian living in New York, sang along in three numbers. A segment of folk songs arranged by members of the choir included “Shenandoah,” a nod to America, segueing into “Waltzing Matilda,” a genuflection to Australia. Here, as everywhere, the performances were captivating, but the music was somewhat overarranged and somewhat denatured, the earthy tunes awash in ethereal counterpoint. For the rest, the music was mostly entertaining on some level and occasionally edifying. But the evening rose to a different plane altogether at the end, with the glorious “Ave Maria” by the 20th-century German composer Franz Biebl. Even here things were tricked up a bit, with a companion piece from Mr. Twist, “Ave Madonna,” setting fragments from Madonna’s “Like a Virgin.” But when it led into the Biebl, it was as if the gates of heaven had opened. With this group, it seems, for a little sublime, you get a lot of ridiculous.